Meditation plays an integral part in a seeker’s spiritual journey, in that it steers the wavering mind into a state of quietude, wherein the tumult of distracting desires loosen their grip. With practice, the mind will be ushered to a deeper realm of stillness. Such a mind gains the capability for a lofty vision and cannot be influenced by anything. As the practice of meditation deepens, one can resolutely face the problems in life and gradually become a yukta, one who abides in one’s real nature. Guided Meditation sessions are conducted at the gurukulam by Swamini Ramananda, 1st and 3rd Saturdays of the month from 10:00 am – 12:15 pm consisting of two sessions with a break followed by Lunch at 12:30 pm. Swamini Ramananda is a long-time disciple and student of Swami Dayananda Saraswati. After having earned a masters degree in Experimental Psychology, a Masters in Counseling and a PHD in Psychology, Swamini became a professor of Psychology in Pennsylvania teaching a variety of Psychology courses for over 25 years. However, she states that her real education began when she met and studied with Swami Dayanandaji. 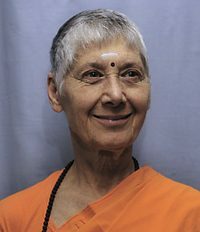 Swamini moved to India in 1995 when Swami Dayananda began an intensive 3½ year residential course in Sanskrit and Vedanta at Arsha Vidya Gurukulam in Coimbatore, Tamil Nadu. After having attended the 3½ year course with Pujya Swamiji, Swamini continued living and teaching in India in either Coimbatore or Rishikesh for 11 years. 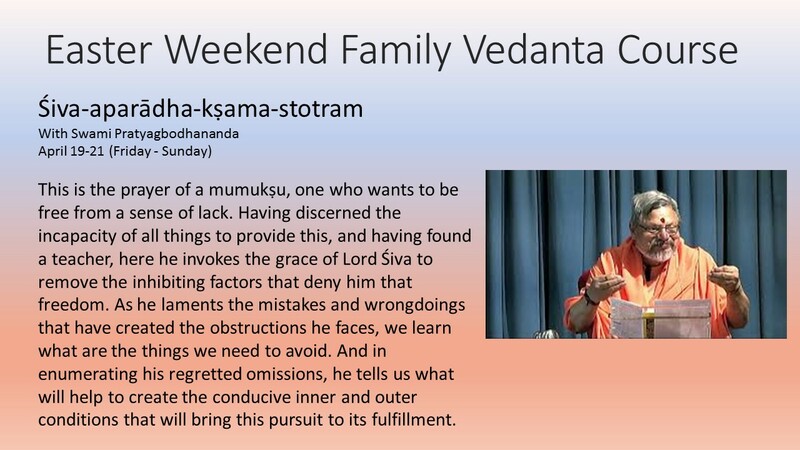 She has been teaching Vedanta and Sanskrit since 1998 in India and in the USA. Currently, she spends much of her time in her ashram-residence, Arsha Jnana Sthana, in Pennsylvania near East Stroudsburg and teaches Vedanta, Meditation and Sanskrit in the Stroudsburg and Saylorsburg area.